Cassel Campground, located in Burney CA (Shasta County), near Mt. Lassen, is surrounded by the most beauty that the Sierra foothills have to offer. Both Mt. Lassen and Mt. Shasta are visible from this area. 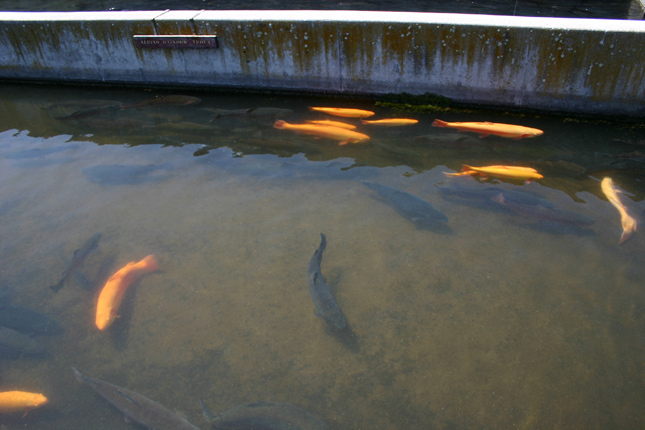 Cassel campground is renowned for trout fishing, as streams, canals and nearby lakes (like beautiful Baum Lake) are stocked full. The campground is full of pine trees, providing adequate shade and landscaping includes manzanita, oak & pine trees and volcanic rock. The Cassel Campground has vault toilets and clean, drinkable water available from multiple faucets abundant amongst the campsites. The Cassel Campground was very clean PG&E does a great job of taking care of their campground. Garbages were emptied daily. There’s adequate privacy between campsites and adequate shade. The campers all seemed very nice and no roudy campers at night. The terrain is very flat, so those with disabilities can get around easily. 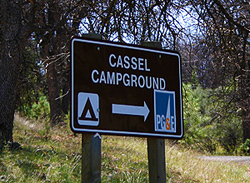 There are a couple accessible campsites at Cassel campground available to those with disabilites. The only thing was that a man-made canal that runs behind the campgrounds (about 50ft from where we were at) and is usually stocked full of trout was empty due to a pipe breakage. But it’s not far to get to the water elsewhere. Update: The pipes have been fixed and the fishing is back to normal. Just right down the road is Baum Lake with a spectacular view of Mt. Shasta in the distance. 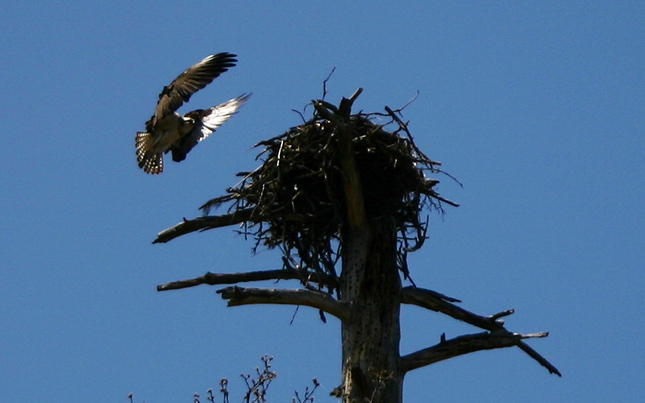 Hawk landing in it’s nest at Baum Lake. 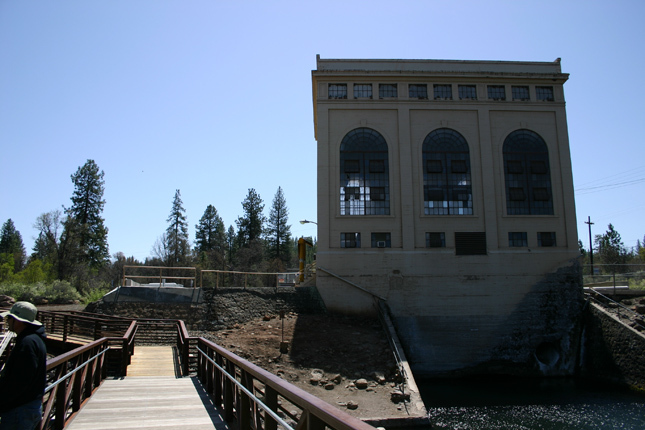 Historical PG&E Powerhouse at Crystal Lake/Baum Lake. Built in 1920. Night time back at the campsite in Cassel Campground. 2 Comments on "Review: Cassel Campground, Burney CA"
My first time at Cassel Campground was in early April with my boyfriend and a couple friends. He had been introduced to this campground through one of these friends. I have to say this was a very great first experience and I’m excited to be going back again with my family and boyfriend for my birthday weekend in June! 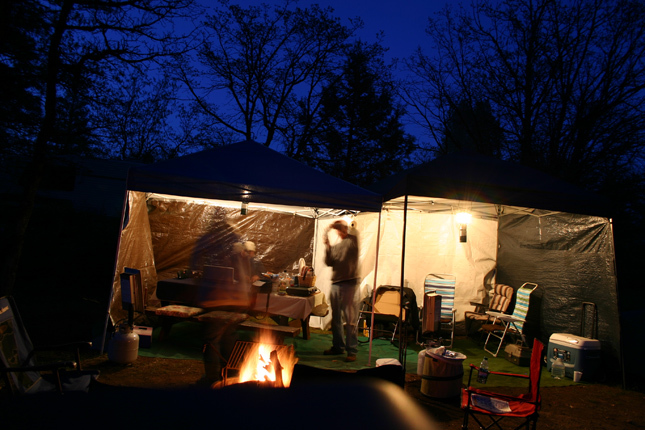 The campsites are a good size and far enough away from others where you still have your privacy. I was really impressed with how clean the bathrooms and sites are kept. Bathrooms are cleaned everyday! There is clean water and lots of shade. There are benches at each site and a fire pit. 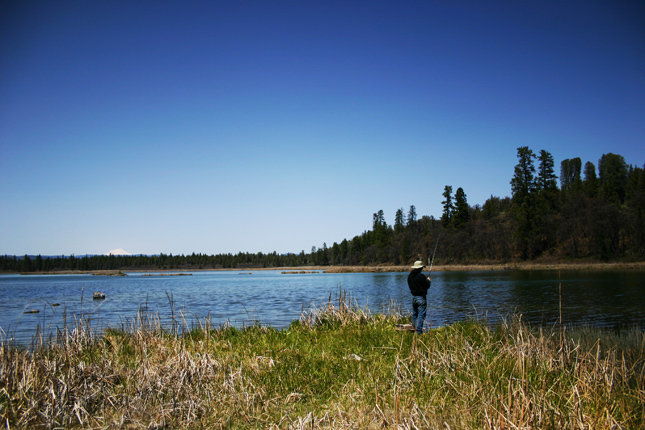 It’s also a great area for those who love to fish! What is especially nice is that it doesn’t get overly crowded but even when there are others in nearby sites everyone is very respectful about noise. The people who work at the campgrounds are also so kind and very helpful and happy to answer any questions you may have! 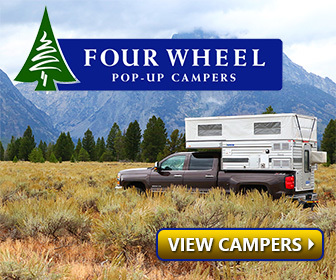 All in all its a great location and great campground! This is a hidden gem! A neighbor told us about this campground so we checked it out on a Sunday because we were planning a camping trip the following weekend. Nice little place, noticed there were three sites that were handicapped, asked about them, told those were first come first serve, no reservations taken for those sites. So we leave in the middle of the week to hopefully get one of those handicapped spots because I am a disabled American vet. We get there and the sites are saved! What do you mean saved. We were told no reservations on those sites. We had also called Sunday evening to verify about those sites as well. Needless to say we were lied to. The camp manger was trying to back pedal and flat out lied to us. We ended up with a nice site but do not appreciate being lied too.